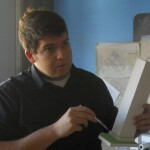 Yesterday’s article went over cost estimates and offered three freeway lid case studies across. 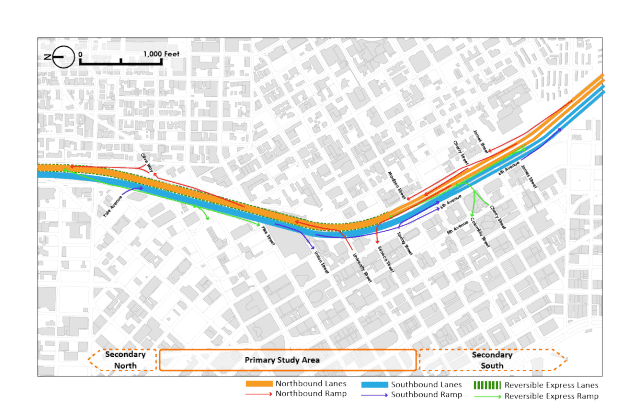 In this third piece on lidding I-5, I will summarize a site analysis for Downtown Seattle and suggest interim solutions that could be used to build support for expansions of lids on I-5. 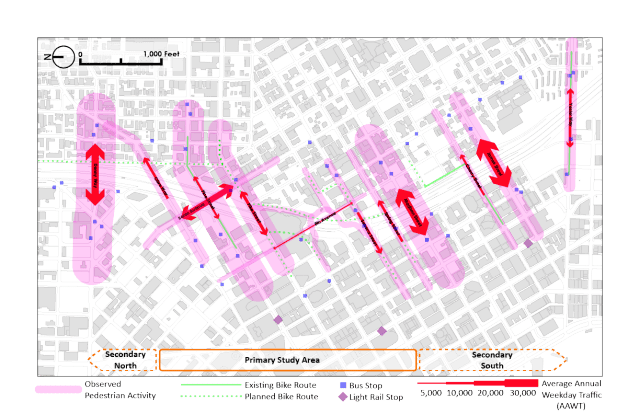 One completing review of freeway lid case studies, my work focused on developing a comprehensive study area site analysis in Downtown Seattle. The site analysis focused on some of the key elements of the case studies, such as traffic and topography. I affirmed the prime location for lidding is between Olive Way and Madison Street, where I-5 runs in a deep trench between the surrounding streets and buildings. I used the existing divisions of freeway airspace to parcel this area into sections numbered, 1 through 6. I also looked at possible redevelopment opportunities around the freeway. At the suggestion of my faculty adviser I expanded the scope into secondary study areas, which are north to Denny Way and south to Yesler Way. Because of their topographic situations, I considered these areas in much less detail. Using public data and my own feet on the ground, I documented characteristics like predominant land uses and landmarks, trees and vegetation, traffic volumes, noise, views, and the freeway’s configuration. King County’s topographical data and WSDOT engineering drawings were used to find the rough dimensions and slope of each study area. I determined that the lid surfaces will need to be sloped or terraced due to grade changes between the sides of the freeway trench. I found no examples of similar challenges in the lid inventory, but there’s no reason it couldn’t be done as long as columns are able to be located within the medians. In my original research process, I had evaluated a concept that would close the Spring Street overpass to create a larger park space between Madison Street and Seneca Street. However, the Madison BRT project now appears to be set on using Spring Street for eastbound buses. Given this limitation, the overpass should be modified or rebuilt to be curbless and possibly even restricted only to transit vehicles. Using site analysis as a basis, I have developed a number of key solutions for improving the environment around I-5 in the short-term. These simple steps will convert marginalized areas into pleasant and useful spaces while building public support for permanent freeway lids. First and foremost, one case study concluded that Freeway Park needs major upgrades and more civic attention. Despite its unique place in Seattle’s public realm, it remains neglected by the city government and its citizens. This is partially due to a legacy of crime and inadequate maintenance since the 1980s, but also because the park is so hidden from the surrounding streets. Hmeless people who find refuge in the park’s dangerous nooks and ledges. A revitalized Freeway Park would be more attractive to families, youth, tourists, and others who wouldn’t otherwise know about it. As the original freeway lid in Seattle, improving Freeway Park’s accessibility and programming will implant a more positive image of lids in Seattleite’s minds. A 2004 report by the Project for Public Spaces made a number of recommendations to improve the park, and I’ve stressed a few of them and added my own. Changes need to be made to the park’s surface structures and entrances. In the spirit of creating a unified pedestrian corridor above the freeway, new handicap-accessible ramps are needed at the Pike Street, Union Street, and University Street entries. Walls around all of the park’s entries need to be lowered and vegetation needs to be trimmed even further. Barriers need to be placed at the hidden ledges where people precariously camp over the freeway. More flexible seating, covered structures, food vending, and frequent daily programming are needed to draw more people into the park. A nonprofit or specialized public office needs to directly manage the park on a daily basis. Another short-term solution is to remove parking from the freeway overpasses. Parking on Pike Street, Seneca Street, Madison Street, and Yesler Way does not directly serve any residence or business. It’s also unnecessary in light of the glut of Downtown parking spaces. The parking lanes can be replaced by anything from protected bike lanes or widened sidewalks to parklets, landscaping, or public art. Bringing more people above the freeway will no doubt spur conversations about further improvements. Both interim and permanent solutions must integrate with other ongoing projects in the area. Broadly, the 2002 Blue Ring open space strategy includes a freeway lid among ideas for linking urban neighborhoods to Elliot Bay and Lake Union. As part of that, Waterfront Seattle promises to reshape the city’s connection to Puget Sound. With the I-5 lids proposed only a few blocks away, the two projects can act as bookends to the Downtown public realm. Improvements on key streets should link these two projects, such as Pike Street and Pine Street. Indeed, the Pike-Pine Renaissance is a proposed plan to create a consistent streetscape between Pike Place Market and Melrose Market. Coming off that could be the Melrose Promenade, a vision to improve the walking, bicycling, and public space experience along the eastern side of I-5 on Melrose Avenue. In a final article tomorrow, I will discuss design guidelines and how to move forward on an I-5 lid in Downtown Seattle. This article is third installment in a four-part series on lidding I-5 in Downtown Seattle. A version of this series originally appeared on The Northwest Urbanist. I would love to see them improve freeway park.. that place is just downright creepy and not intuitive at all to walk through. >> … the prime location for lidding is between Olive Way and Madison Street … I expanded the scope into secondary study areas, which are north to Denny Way and south to Yesler Way. Prime by what criteria? Ease of construction? If so, I suppose. But from other measures, not so much. From a pedestrian access standpoint (not to the park itself, but from a neighborhood on one side to the other) the most valuable park would be from Denny to Belmont Avenue. This is the area with the largest gap between pathways over (or under) the freeway. This is where the freeway sliced the neighborhoods the worst, and where a park would repair the damage more than anywhere else. It is about 3/4 of a mile between there, several times the next biggest gap. That might be too expensive. Perhaps a pedestrian bridge would make more sense (right in the middle). But if you had the money, the park would serve as the bridge, and a fantastic one at that. FYI: the text in the pictures is really small and clicking them doesn’t zoom in. Great work otherwise! Yeah, a higher resolution picture would make it much easier to understand. FYI: the text in the pictures are really small and clicking them doesn’t zoom in. Great work otherwise!